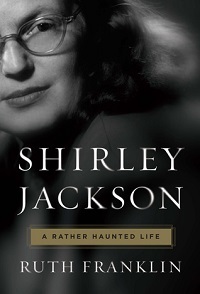 I didn’t think it was possible for me to shed tears over a biography, but by the time I got to the end of Ruth Franklin’s book about Shirley Jackson, I was so attached to Jackson that reading about her early death got me a little choked up. Franklin’s book is a comprehensive biography that explores Jackson’s life and work, as well as that of her husband, the literary critic Stanley Edgar Hyman. She takes a straightforward chronological approach, considering how her life and work influenced each other, both in the subjects she chose to write about and how she balanced work and family life. As a 1950s wife and mother, Jackson bore the responsibility of taking care of her children, and her literary achievements meant that she also carried the financial burdens when her husband failed to achieve the same levels of success. It’s no wonder that she struggled at times. I came to this biography having read three of Jackson’s novels (The Haunting of Hill House, We Have Always Lived in the Castle, and Hangsaman); her short story collection The Lottery and Other Stories and a handful of other stories; and her parenting memoirs, Life Among the Savages and Raising Demons. Because Franklin builds so much of the biography around her work and discusses some of it in detail, it’s most rewarding to those who already know her work. Franklin describes her other novels well enough for me to understand the chapters about them, but the details could constitute spoilers to those who don’t know the work. Jackson herself was a fascinating person. Her imagination was remarkable, as was her willingness to take risks in her fiction, creating dark and unsettling stories whose meaning is difficult to discern, even as the style and atmosphere are absolutely hypnotizing. And yet she also wrote lively comic and confessional memoirs that Franklin notes could serve as a sort of precursor to today’s mommy blogs. I found Jackson, as presented in this biography, tremendously easy to like. Even when facing down agoraphobia, she found ways to get on with life, bit by bit and little by little. When she fell apart, I sympathized with her. Franklin is a compassionate biographer who appreciates Jackson’s genius and helps readers to see it, too. This doesn’t feel like a hagiography or a defense of Jackson—it’s just a straightforward presentation of a brilliant writer’s sometimes haunted life. This is a lengthy biography, with 500 pages of text, but it reads quickly, largely because Jackson is such an interesting person and her life takes so many turns that keeps it from becoming tedious. There were points where it started to feel, however, like a joint biography of Jackson and Hyman. I could have done without so much detailed discussion of his work. His life and work are relevant to Jackson, of course, but a few paragraphs would often have sufficed and felt less like a distraction. Enjoyed reading your thoughts on this. It’s on my TBR but I feel like I want to read a few more of Jackson’s books before I dig in. Reading more of Jackson’s book is always a good idea, and it will definitely enhance your enjoyment of this book. I really enjoyed this book! I don’t tend to read biographies and was a bit daunted by the length, but it was very engrossing. I’ve read We Have Always Lived in the Castle and The Haunting of Hill House, and this biography made me want to read more of her work. I’ve enjoyed everything that I’ve read of hers. And this made me want to read the two novels I haven’t gotten to yet. I’ve gotten onto a Jackson kick lately and this was a treat to read as well. I really want to read the earlier novels now. OMG! I loved that book. Seriously, I loved it. There was so much in that book I didn’t know about Jackson, and I totally ate all the information up. My mom loves Shirley Jackon, and passed that love onto me. Last year, she gave me her old copy of Life Among the Savages. Another good read. GOOD review!